LYNX Rapid HRP Antibody Conjugation Kit® enables the rapid conjugation of a pre-prepared lyophilized mixture containing Horseradish peroxidase (HRP) label to an antibody or protein. Activation of proprietary reagents within the antibody-label solution results in directional covalent bonding of HRP to the antibody. If possible, avoid buffers containing nucleophilic components such as primary amines and thiols (e.g. thiomersal/thimerosal) since they may react with LYNX chemicals. EDTA and common non-buffering salts and sugars have little or no effect on conjugation efficiency. Sodium azide is an irreversible inhibitor of HRP and therefore should be avoided. The amount of antibody used for labeling ideally should correspond to molar ratios between 1:4 and 1:1 Ab to HRP. Taking account of the molecular weights (160,000 versus 40,000), this means for that for 100μg HRP you need to add between 100-400μg of antibody.  For optimal results the antibody volume should be up to 100μl, at a concentration range of 0.5-5.0mg/ml. The amount of antibody used for labeling ideally should correspond to molar ratios between 1:4 and 1:1 Ab to HRP. Taking account of the molecular weights (160,000 versus 40,000), this means for that for 10μg HRP you need to add between 10-40μg of antibody. For optimal results the antibody volume should be up to 10μl, at a concentration range of 0.5-5.0mg/ml. The amount of antibody used for labeling ideally should correspond to molar ratios between 1:4 and 1:1 Ab to HRP. Taking account of the molecular weights (160,000 versus 40,000), this means for that for 1mg HRP you need to add between 1-4mg of antibody.. For optimal results the antibody volume should be up to 1ml, at a concentration range of 0.5-5.0mg/ml. The amount of antibody used for labeling ideally should correspond to molar ratios between 1:4 and 1:1 Ab to HRP. Taking account of the molecular weights (160,000 versus 40,000), this means for that for 5mg HRP you need to add between 5-20mg of antibody. For optimal results the antibody volume should be up to 5ml, at a concentration range of 0.5-5.0mg/ml. The amount of antibody used for labeling ideally should correspond to molar ratios between 1:4 and 1:1 Ab to HRP. Taking account of the molecular weights (160,000 versus 40,000), this means for that for 4mg HRP you need to add between 1-4mg of antibody. For optimal results the antibody volume should be up to 1ml, at a concentration range of 0.5-5.0mg/ml. Newly-conjugated antibody can be stored at 4oC. For long term storage however, the addition of a preservative is recommended, although sodium azide should be avoided. 1. To the antibody sample add 1μl of the Modifier reagent for every 10μl of antibody and mix gently. 3. Replace cap onto vial and incubate at room temperature (20-25°C) for 3 hours, or overnight if preferred. 4. After incubation, add 1μl of Quencher reagent for every 10μl of antibody used. Leave to stand for 30 minutes before use. Bondzio, A. et al. (2011) Identification of differentially expressed proteins in ruminal epithelium in response to a concentrate-supplemented diet. Am J Physiol Gastrointest Liver Physiol. 301 (2): G260-8. Lichtmannegger, J. et al. (2016) Methanobactin reverses acute liver failure in a rat model of Wilson disease. J Clin Invest. 126 (7): 2721-35.